Christina Junor 1834 [C7231] - $24.00 : Yarn Tree, Your wholesale source for cross stitch supplies. 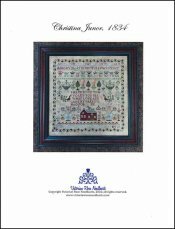 Cross stitch pattern by Victorian Rose Needlearts. Christina Junor stitched her delightful sampler in the year 1834 when she was ten. Her sampler is typical of Scottish samplers from the same time period with its strong red & green colors choices, the seven tailed peacocks, crowns with sets of initials, urns of flowers, & simple house motif. The red-stemmed plants may be some commonly found in a Scottish garden, such as dogwood. The darker crowns usually represented deceased family members. Stitch count 244w x 240h.